Not only is Melbourne inflicted with legacy of poor planning, design and development over the last 15 years or more (no thanks to Bamboo Rob Adams from the City of Melbourne and Victoria’s failed State Architects), it’s celebration and exploration of Architecture and design is dismal. 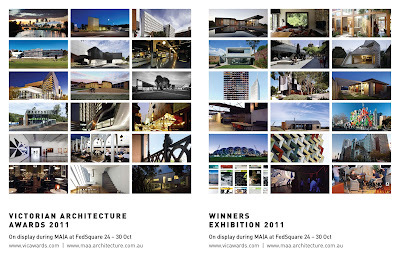 I attended the Australian Institute of Architects –2011 Victorian Architecture Award Winners Exhibition at Federation Square, (A testament to poor planning and design in itself). The exhibit display was pathetic, a few cheap posters stuck amidst an open book stall. Very disappointing, the organisers of the exhibition should hang their heads in shame. The award exhibition had a nothing to desire and if anything reflected poorly on the state of affairs in Melbourne’s Architectural and design community. Melbourne is a City of Architectural disasters (most designed by Denton Corker and Marshall) there is a host of other designers that have also contribute to Melbourne’s malaise and lack of built environment creativity. That is not to say that there are no Architects of merit. To the contrary Nonda Kostelidous is brilliant and I also like the work of Ellenburg and Fraser who were featured in the 2011 designer awards but the exhibition did not serve them well, so show therir work in favourable light. Melbourne needs a dedicated modern art and design museum that is attached to a large hard edge open space. We have a museum to the moving pictures why not design and architecture. If we do manage to get around to constructing an architecture design museum I hope the AIA is kept well aware from it. the Architects themselves should have a say in how they want to display their award winning designs. They should be the ones that tell the story behind the project. The award exhibition should be much more informative, creative and inspiring.